In order to trace a tapping device you need a professional, easy-to-operate locating device which measures the electric field strength of the tapping device. This can be measured because the field strength of the eavesdropping unit is stronger at 10 – 100 cm than local transmitters. The sensitivity is adjustable by potentiometer. The acoustic and visual display changes when approaching the tapping device which allows a quick location of AM or FM, analogue or digital tapping devices. The acoustic alarm can be switched off and be replaced by vibration alert. This allows totally silent location even of mobile phones or remote controls. 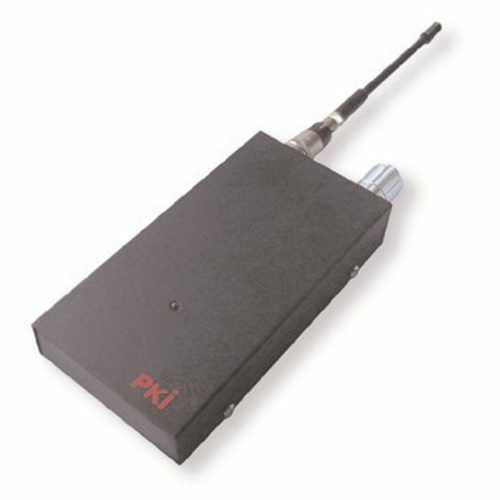 The wide band antenna offers the necessary sensitivity for the large frequency range of the PKI 4215.